We may have melons (jenny lind, cantalope, and watermelons) today, but we won’t be sure until we take a good look out in the field. And, if not this week, it looks like we should have some ready next week. I grew up in a house with red raspberry bushes and Concord grapevines, and I’ve spent the last ten years since moving missing them. As anyone in my immediate family can attest, when a garden catalog arrives, I usually have a grand plan of some kind for getting blueberry or raspberry bushes so I can have homegrown berries again. (My family can also attest to the fact that berries don’t last very long when I’m around. That’s a different story.) 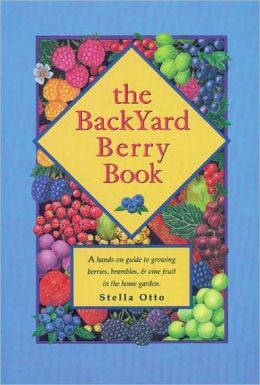 So, I was excited to find Stella Otto’s The BackYard Berry Book on Theresa’s bookshelf a few weeks ago! I found the book to be very detailed and thorough, focusing on what it defines as “small fruit” – strawberries, brambles, blueberries, lingonberries (WordPress’s spellcheck has apparently never heard of lingonberries…), currants (which I saw and tasted for the first time this weekend at my grandparents’ house), gooseberries, grapes, and kiwifruit. The first several chapters address general topics important for the gardener wishing to grow small fruit – site selection and preparation, soil requirements, plant selection and propagation, the anatomy and development of small fruit plants, pest control, and disease identification. The glossaries of pests and diseases contain several illustrations, and advice for dealing with these problems should they arise. The remainder of the book is divided into chapters dedicated to a specific small fruit (for example, a chapter on blueberries, a chapter on currants and gooseberries, etc. ); each chapter discusses the fruit’s specific soil and site requirements, varieties and their uses, fertilizer and water needs, pruning and mulching suggestions, ripeness indicators and expected yields, and information on pests and diseases specific to that crop. A fun fact from the book (and from my Fall 2012 Applied Plant Science class): botanically, a true berry is a simple fruit, formed from one ovary, with a fleshy pericarp and one or more carpels. Grapes, currants, and blueberries are all true berries, as are tomatoes and cucumbers (just to keep things interesting). Strawberries, raspberries, and blackberries are not true berries, but aggregate fruit. 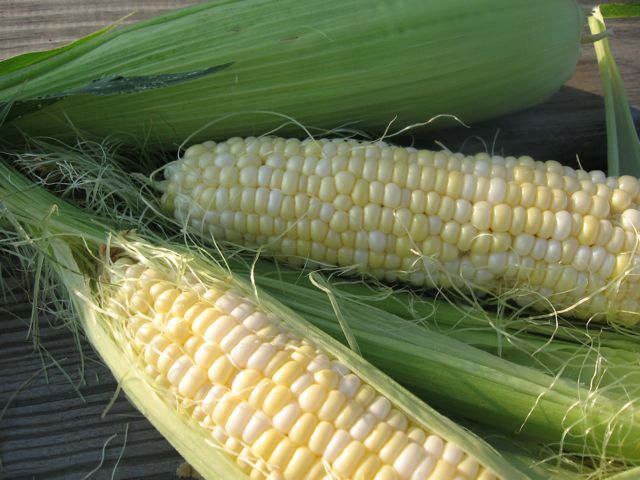 There is a lot you can do with sweet corn besides eat it as corn-on-the-cob. Here are three recipes I’ve tried which I highly recommend. We’ve stopped harvesting our Spring kale. The heat and harlequin bugs were starting to take a toll on its quality and flavor. But, we just seeded for kale transplants which we will plant out in the field in about a month for our fall crop. We are between plantings of lettuce mix. All of the rainy weather we had a couple of weeks ago delayed our planting. We have more planted and growing, but it will be a couple of weeks before it will be ready to harvest. We have melons (jenny lind, cantalope, and watermelons) coming along, but the cool spring we had delayed their planting making their harvest later than normal for us. We hope to harvest some in a couple of weeks. Okra has just started to flower and produce pods. We may have a limited amount to bring in today, but as the plants continue growing, their production will gradually increase. Zinnias, Snapdragons, and Rudbeckia – Oh my! Each of the past two weeks, after most of Friday’s harvesting is done, a few of us have gone into the fields to cut bouquets of flowers for the CSA pick-up and Saturday’s market in Chestertown. 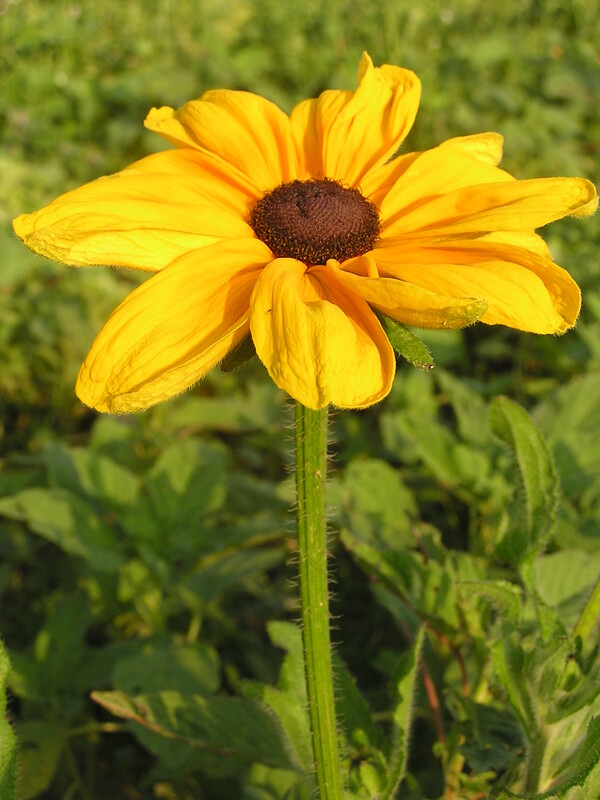 At the moment, we have (as the title of the post suggests) mixed colors of zinnias and snapdragons, and about half of a bed of rudbeckia (also known as Black-eyed Susans – Maryland’s state flower!). We usually bunch flowers in bouquets of a dozen stems, and they are available as one ‘unit’ at the CSA pick-up. (Bouquets are also available at the Chestertown market, while supplies last, at the Saturday market for $5.) I’ve been out and about with my camera again, and I wanted to share a few photos of our beautiful flower beds – I’ve always loved taking close-up pictures of flowers! Our zinnias right now are the State Fair mix and Benary’s Giant varieties (according to the label stakes in the bed), and are a vibrant mix of pinks, corals, purples, reds, oranges, yellows, and the occasional white or ivory bloom. We transplanted them on one of my first days on the farm in early May. (That day, we also transplanted sunflowers, which shortly thereafter were systematically dug up by some critter or another… Sigh.) I will always have a soft spot for zinnias. In the house where I grew up, my brother and I were each allowed one bed in the garden in which we could grow (or at least attempt to grow) whatever we chose. I grew many kinds of flowers over the years, but there were almost always zinnias of some kind for a cheerful pop of color! 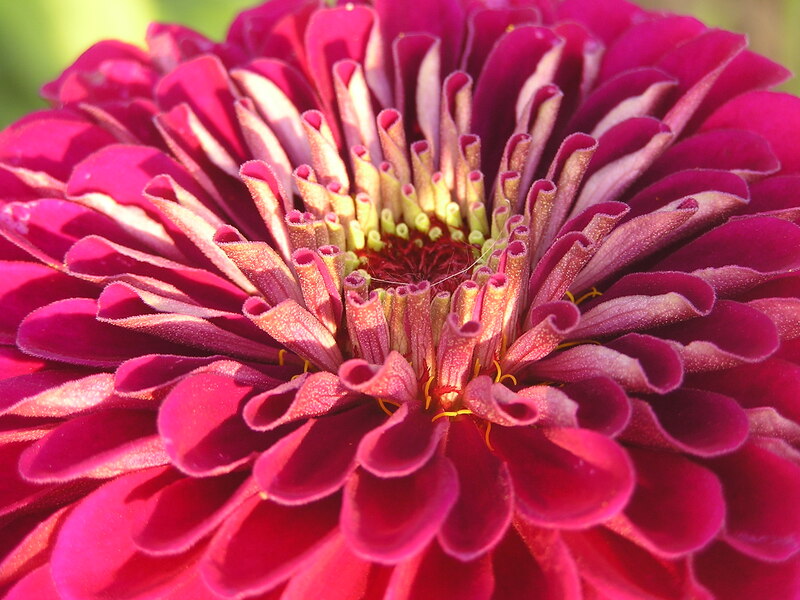 Watching the zinnias growing on the farm brings back wonderful memories of that house and its garden. 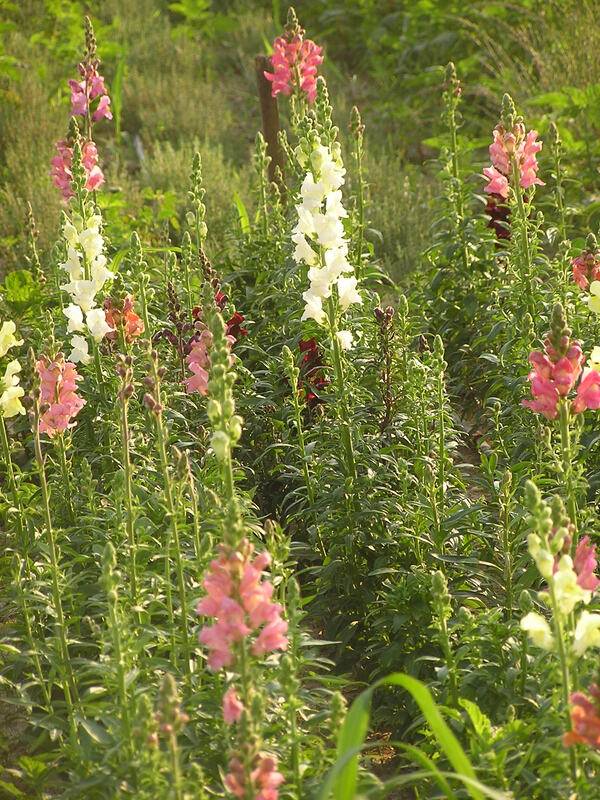 Our snapdragons, at the opposite end of the farm from the zinnias, are a mix of whites, yellows, lavenders, pinks, corals, and deep reds (which to me look like they’re made of velvet). My personal favorites are the ones shown in the photo to the right – they are pink and coral and orange, all on the same flower! 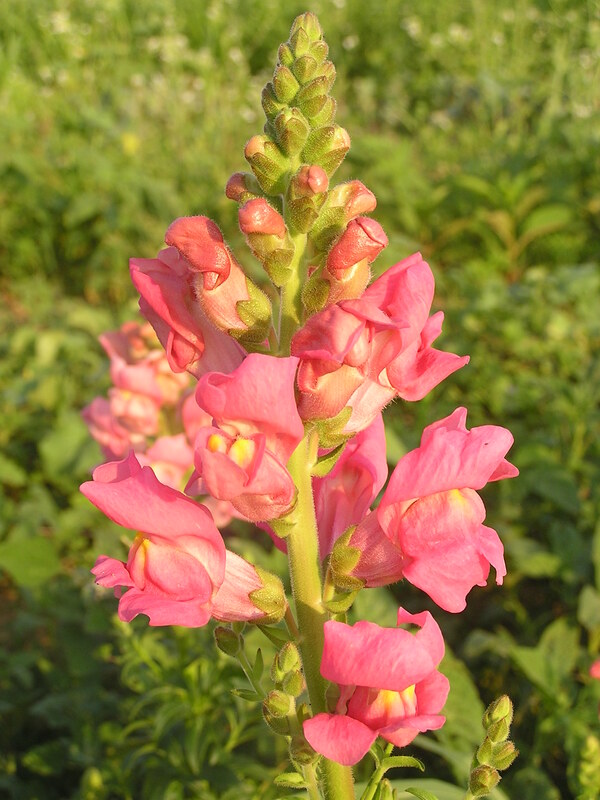 Stunning as a single stem, the snapdragons are even more beautiful in bunches. Two weeks ago, when I last was part of the flower-cutting group, we joked with a workshare member that each of us had a different way of making bouquets – some of us mixed the different flower varieties, some preferred to stick to single varieties, some carefully color-coordinated each bunch, some of us decided that a bouquet of zinnias had to have at least one of every possible color, and so on. No matter how they’re bunched, though, they are all beautiful, summery, and cheerful, and guaranteed to brighten your day – and any room in your house! This will probably be the last week for kale. The heat and harlequin bugs are starting to get to the plants. We may have some cherry tomatoes this week, but only a few are starting to ripen, so we we will probably only have a limited amount. We’ve started pulling and drying our garlic. So far, we’ve pulled the the Spanish Roja and Music. The Spanish Roja is almost dry enough to start giving it out. We should have some either this week or next. Our bell peppers are also starting to size up. We may start giving them out soon.